Q: What brought me to the chair today was to come from what I am, having broken enough ground to have you pour into it and to come from that with you, here. The part that I thought would be here more is being in my heart so that when all of the ‘it’s too big for me’ parts start to come in, they’re not too big for me anymore, and it just becomes a joy to let in that expansiveness. At times it’s a flow it’s broken and patchy but it’s still there. It’s not far away. But the dropping into the heart isn’t always there. I’m not always aware of that. 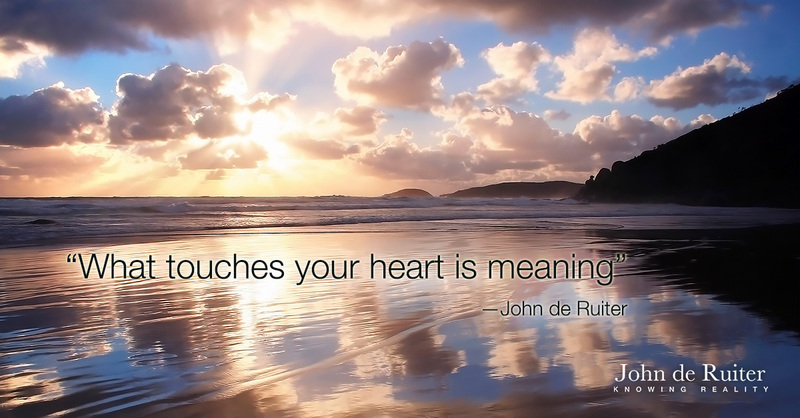 John: If the rhythm of your being is in a decrease, it will be difficult for you to experience being in your heart. Q: So that is what’s happening. The rhythm of my being is in a decrease? John: You can’t conclude what I’m stating. You can just hear it. Q: Can you explain more about the decrease of one’s being? John: Its outstanding rhythm can move from level to level. It can move to a level that is completely independent of your self. Its movement has no relationship to your self and it can, from there, move to a level that has a relationship to your self and how you are relating in your self. For you to stably come from your own being, you need to be able to move as awareness with its rhythm, regardless which level of your being the rhythm is coming from, each one affecting your experience in your self of what there is or what there isn’t. The effect of this rhythm on you in your self is important to your development. If you try to follow it in your thinking and based on your experience, it’s confusing. All you have as awareness in following that rhythm is knowing. That can come with experience or without experience. The decrease can come right when it seems to you that you most need increase. If you adhere to any sense in your self in your relationship with the rhythm of your being, you’ll be separating from that rhythm and you’ll be set against your own being. Openness and softness answers any misunderstanding. When you are in synch with the rhythm of your own being, as that rhythm comes from different levels of your being, every line in your self will eventually be hooked. It will bring up every manner of discomfort in your self. It will bring about every kind of pressure in your self. It brings up everything that you haven’t dealt with in your self. It will sift your self. Being sifted in your self, because of your adherence to the rhythm of your own being by you being what you know, takes apart your own comfort zone. It removes you from your relationship with comfort in your self. Instead of you being separate from your own being, you’ll experience in your self how separate your self is from your being. You’ll experience how much your self isn’t like your being. Your self is not like what you really are. The true development of your self comes by you being the same as your own being in the midst of a self that isn’t like that yet, regardless of how uncomfortable that is, regardless of the strange pressures in that. Q: I’ve loved seeing that lately the self that isn’t me, that isn’t what I am. That’s what feeds back to me what I am, observing that form as a level for me to move into what I am and be aligned with what I am, and I see that as my first purpose. Part of me is screaming for more, and then the other part just sort of doesn’t know how to handle it, hold it, and yet I’m aware of it landing and landing and landing where it needs to land. John: In your self, while you’re aligned with the rhythm of your being, it’ll be easy to feel like you are a victim of that rhythm, a victim of truth somehow. It can be easy to feel like it plays tricks on you, that it’s unfair with you. You’re experiencing the disjointedness of your self, that your self on a deeper level doesn’t fit together very well. It’s in your accustomed self, the way that you normally experience your self, that it seems like there’s a continuity in your self. It all moves in a way that generally makes sense to you. When you’re in response to what is deeper than your self, you will lose that held-together cohesion, and you’ll be subject in your experience to what your self is actually like. That can be most unpleasant. The energy of your own beliefs will most stand out and rail against you, but because it is in your self you’ll experience it as being real. You won’t see it for what it is. It will all seem real to you. It is all meant to incline you as awareness to believe your self. When you align to the rhythm of your own being, you’ll be awakening the multi-leveled gauntlet of your self. In living, you’ll be subject to that gauntlet. You can relieve the pressure of that by simply believing your self, adhering to your self, taking your self to heart. When you adhere to the rhythm of your own being, that can make you feel in your self like you’re dying. There is a real dying that’s taking place. It isn’t your self that dies. What dies is your patterned way of relating to your self. Q: What’s holding together those patterns, John? John: A self-orientation. What holds the patterning together is past investments of want and need. They all continue in the present, not so much directly in your self but in your subconsciousness. They are all mechanisms controlling your experience of your self. As you adhere to what you think and feel in your self to tell you what is true, you’re adhering to your subconscious mechanisms, whether you realize it or not, whether you believe it or not. The true interruption to the cohesiveness of this patterning in your self, your patterned way of relating to your self, is openness and softness of heart. As the cohesiveness of your patterning is interrupted and diminishes, the vulnerability in your self increases, making you feel in your self that you’re getting worse and it’s all going backwards. Your self tells you how you are doing in this world. It doesn’t tell you how you are actually doing. In your self, you don’t relate to what you know the truth of. In your self, you relate to what affects your self. You relate to how others see you and treat you. When you relate to your self, you are unseen. Your direct experience of your self from the perspective of your own being is that your self is made of forms of separation, and that it requires the constant maintenance of self-oriented doing to create comfort. When you sign-up, within, to be what you know, you are really taking your self on, as it actually is. When illusion is removed, you’ll realize why, before, you didn’t want to see. What you see when illusion is removed is most unappealing to your self. If you don’t want to see, that can be accomplished as easily as looking away from what you’re seeing. As you look away, in a fraction of a moment you can cover what you know and then look back again, and what you see will be all different. That kind of power in your self is always at work. It ceases when you are oriented as awareness simply to what you know in your heart. Your self un-distorts and you’ll experience your self in its actual condition. It will feel and seem so distorted, but if you have any aversion to the actual condition of your self, your being cannot fill your heart and a being-filled heart cannot come into your self. Q: Thank you for placing that into me. The picture just looks like a…a journey of discomfort filled with the joy of seeing and being right-side up. I love you…and I love that you’re here with me, even in the black. As I…as I look around, you’re there in me.